Welcome to the dog days of summer! This week we offered double-header yoga sessions running from 10 AM-12 PM and had a bunch of new and regular yogis join us. As the yogis saluted the sun, our vendors were hard at work serving up breakfast and lunch from Whistlestop Cafe, the Global Kitchen, and Harvest Moon Bagel Co.
Our sweet tooth was not to be forgotten either as Fudge-o-lutely, The Baker’s Lover, and Tropipop (our newest cold treat vendor!) brought new seasonal flavors inspired by the summer days–earl grey cardamom fudge, honeydew basil popsicles, and more! Even our body care vendors, The Raw Spa and Lyes and Lathers were inspired by the season. The Raw Spa introduced their new “Farm Stand Line” of products. The line consists of a range of products–face fondant, face washes, skim parfaits & quench creams–in the decadent flavors of heart beet, light bulb, strawberry shortcake, and rhubarb crumb. The coolest part? Ask Mack and she can tell you the exact farms she derives all of her ingredients from. This week she used beets and fennel from Horse Shoe Ranch and strawberries and rhubarb from highland orchards how awesome is that?! We’re a few weeks into the market season and things are going great! Despite a few rainy days, East Side Market is looking better than ever. On May, 15th we opened in conjunction with Open Streets Lancaster to great success and a warm welcome from both local residents and tourists alike. A week later our very own Horseshoe Ranch brought out their baby calf along with pickle the goat and a couple of his friends for our first “Kid’s Day” of the summer (more to come). The petting zoo was certainly a highlight of that day as we all saw great success and enjoyed the family atmosphere in the beautiful Musser Park. It’s not a major holiday, but it’s an important one all the same! June 17 is National Eat Your Vegetables Day, right in the middle of National Fresh Fruits and Vegetables Month. This time of year is an exciting one for vegetables. You can still find cool-weather crops like lettuce, peas, kale, and chard, while root vegetables have also had time to grow adding radishes, carrots, and beets to the mix. It’s been great salad weather lately, so why not make Eat Your Vegetables Day into Eat Your Vegetables Weekend, and stop by market to stock up on all things local. Lettuce Salad on Bed of Roasted Beets: Slice 1 large or 3 smaller beets as thin as possible. Toss with 1 T olive oil, ¼ tsp salt, ½ tsp fresh thyme leaves. Spread on oiled sheet and roast at 450 degrees 20 minutes or until tender. Spread on plate, sprinkle with vinaigrette, and top with goat cheese and toasted walnuts. Toss lettuce with vinaigrette and top the beets. 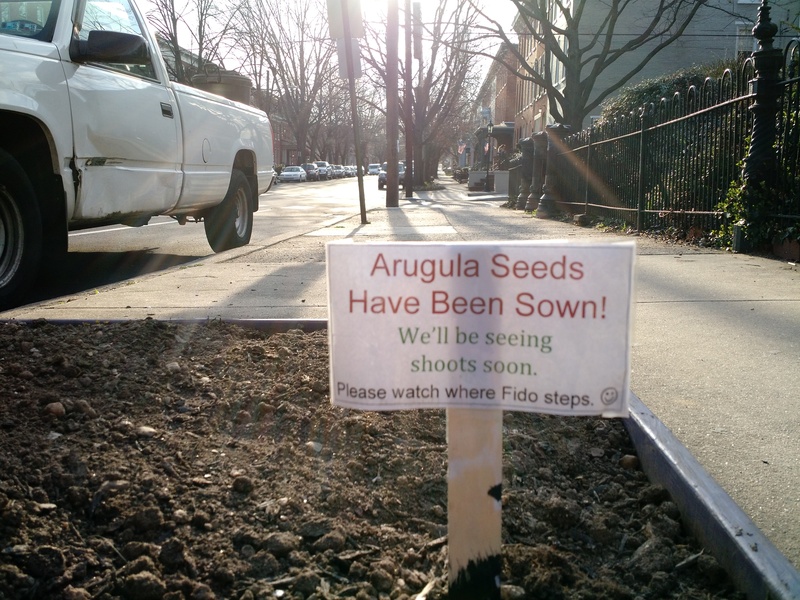 Guerilla gardening refers to a movement to reclaim or beautify public spaces with plants. Often this takes places in urban environments, and can range from dropping a few seed bombs to building a functioning farm on an abandoned lot. 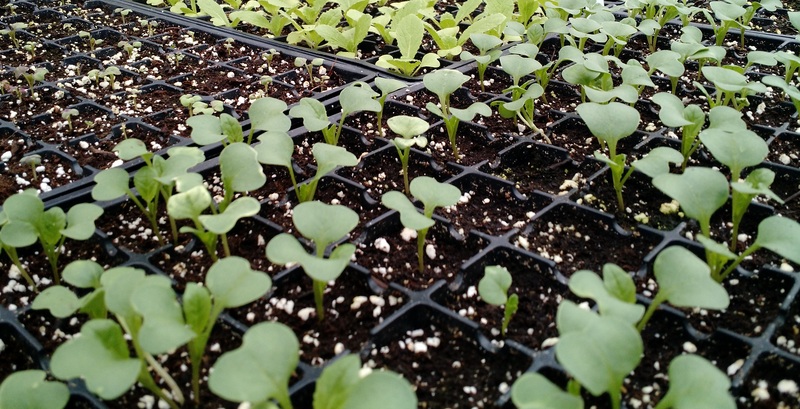 Rachel de Vitry, a Lancaster native currently working as Farm Manager for Neighborhood Foods Farm in West Philadelphia, shares some notes from her experience with urban guerilla growing here. Learn more at her market skillshare June 28 at 1pm. Food deserts=abandoned lots=growing spaces. Underserved communities are often food deserts but aren’t without resources, namely abandoned lots which can be reinvented as space for growing food and flowers. The city’s heat island effect means longer growing seasons. The spring frost date in Philadelphia is April 15, a full month before Lancaster County’s on May 15. Hooray for time to grow more crops, and more heat-loving crops! The #1 pest on our farm? Feral cats. No deer and only occasionally groundhogs or raccoons on the farm, but the cats love to sleep in greenhouses and under rowcover fabric, and dig in the nice loose dirt of beds we’ve just planted. There’s no break from insect pests. While there may not be another garden nearby to harbor pests, many common weeds are in the same plant family as vegetable crops and those weeds can harbor pests. Lambsquarters is a common weed in the goosefoot or beet family, and leaf miners will start munching on lambsquarters before moving onto our beets and chard. Limited space leads to super efficient growing. Last year Neighborhood Foods Farm grew 12,436 pounds of produce on 18,704 square feet, or .43 acre, of growing space. Gardens can’t happen without neighbors’ support. Neighbors help us identify lots that would make good garden or farm space, and keep an eye out when we’re not there. And once the garden is in place, you will be amazed at how many neighbors are accomplished gardeners and want to help out. Infrastructure is very accessible. Farm or garden sites often have fairly easy access to power and water. Using city water on the farm has the added benefit of removing the need to pay for water tests; the city tests regularly for contaminants so you don’t have to. Squatting on abandoned lots is actually ok. Philadelphia’s unofficial-official policy on empty lots is that it’s better to have a garden than a short dumping site or location for illegal activities. So no one will yell when you haul out the junk and put in some planters. Getting legal rights to your squatter’s garden can be extremely difficult. Getting a lease from the city can take years, and if the site goes up for sheriff’s sale it can be sold out from under you. Plus, one lot may be made up of several different parcels each with different owners and legal challenges. Urban growing makes hyperlocal eating possible. The majority of our markets and wholesale customers are within 5 miles of our farm site. We provide fresh produce to a neighborhood with limited access to healthy food, and provide chemical-free hyperlocal produce to inner city residents looking for a more sustainable lifestyle.